Construction Chemicals Market size will likely cross USD 50 billion by the end of 2024 growing at a CAGR around 9%. The construction sector has witnessed a considerable growth rate since the economic downturn of the previous decade. It generated over USD 3 trillion in the BRICS nations in 2015 and will likely flourish at a CAGR beyond 10% to surpass USD 9 trillion by 2024, hence propelling the global ferroalloy market demand. Moreover, international level events such as the Olympic Games, Commonwealth Games, FIFA and ICC tournaments, etc. in these regions will further augment the regional market in the forecast span. Global construction chemicals market growth may face restraints due to lack of awareness about the product benefits in the developing countries. Also, lack of training regarding the usage of the product may pose a threat to the industry growth in the coming years. Moreover, high product costs may hamper the market as most small and medium level builders and contractors tend to minimize the overall construction costs to maximize profit. 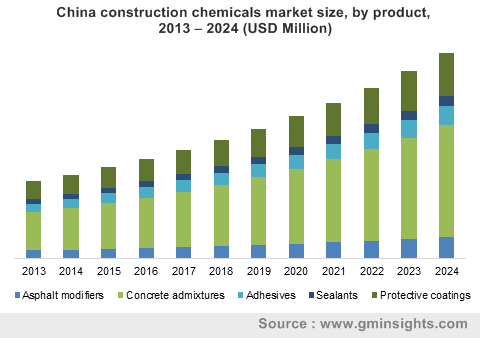 Construction chemicals market has been segmented into five principal product categories including concrete admixtures, protective coatings, asphalt modifiers, adhesives, and sealants. Concrete admixtures accounted for more than half of the global market in 2015 and will likely gain the market share at a significant rate in the next eight years. Inherent property of the chemical to improve the concrete quality, accelerate or delay the setting time, enhance chemical and physical resistance, improve the concrete workability, and enhance finishing will boost the industry growth with increasing demand for customized residential and commercial buildings. Concrete admixtures are further segmented into chemical and mineral admixtures. Chemical admixtures consist of normal plasticizers, superplasticizers, accelerating agents, retarding agents, air-entraining agents, waterproofing admixtures. Mineral concrete admixtures studied in the report are rice husk ash, fly ash, granulated blast furnace slag, and silica fume. Growing demand for existing building modification, repair, and maintenance works will escalate the demand for adhesives and sealants in the forecast span. Adhesives generated more than USD 2.5 billion for the construction chemicals market in 2015, while sealants were worth more than USD 1.5 billion in the same year. With increasing global tourism and increasing efforts to conserve the regional heritage, adhesives and sealants demand will witness a noteworthy growth in the coming years. Asia Pacific construction chemicals market accounted for a considerable share in 2015 owing to the heavy industrialization and urbanization of countries including China, India, and Japan. In 2015, the region registered more than USD 14 billion and will likely flourish at more than 9% CAGR on the account of rapidly increasing population and fast developing economies of China, India, Japan, and other South East Asian countries such as Indonesia, Malaysia, Vietnam, Philippines, etc. Increasing government investments to develop the infrastructures will also have a positive impact on the market in the coming years. Booming construction industries in the BRICS nations, led by China and India will have a major influence in the global construction chemicals market enhancement in the coming few years. Rapidly escalating population along with the developing economies of these owing to several government initiatives and private investments has supported the regional construction industry. For instance, the Brazilian government made a USD 1 trillion investment in 2009 for developing housing facilities for low income group families. Smart City Mission launched by the Indian government in 2015 with a funding of up to USD 15 billion will also catalyze the overall construction industry, hence augmenting the construction chemicals industry in the coming years. Europe construction chemicals market generated over USD 4.5 billion in 2015, and will have a relatively slow growth rate at around 8% CAGR throughout the forecast span. Less infrastructural development activities in the region will hamper the demand for asphalt modifiers, which is extensively used to build roads and pavements. Abundance of heritage buildings in the region may influence the demand for adhesives, sealants, and protective coatings used for maintenance and restoration works. Construction chemicals market company share is highly consolidated with the presence of multinational business conglomerates. The top four manufacturers account for around half of the global construction chemicals industry share. The competitive landscape is characterized by the continuous development of manufacturing facilities in order to meet the growing global demand. The manufacturing companies rely on strategic mergers, acquisition, and partnerships to enhance the production capacities and technologies to maintain the market positions. Key construction chemicals industry players include BASF SE, Sika Group, Arkema, Dow Chemical, W. R. Grace & Company, RPM International, Fosroc, Ashland, Evonik Industries, 3M Company, Henkel AG, AkzoNobel Chemicals, Tremco Group, Tata Chemicals, Pidlite Industries, Knopp GmbH, MAPEI, Gujarat Alkalies And Chemicals, Albemarle, and Huntsman Corporation.